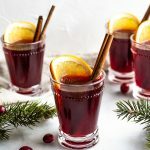 This 5 Ingredient Mulled Wine will warm your heart and knock your socks off it’s so good. 5 simple ingredients come together on the stove or in a crockpot for a cup of cheer. Add the apple cider and mulling spices to a large stockpot. Turn the heat to medium and heat, stirring occasionally. Do not let this boil. When it starts to steam, turn the heat to low and pour in the wine and Grand Marnier. Strain out the mulling spices. Serve immediately in mugs or glasses with cinnamon sticks and orange slices. If you’re not serving this all at once, heat occasionally on low heat with the lid on or transfer it to a slow cooker set to warm. You could even make this in the slow cooker by adding everything and turning it to low heat and turning the dial to keep warm when you’re through. You can cut this batch in half or double it based on your needs. It’s very forgiving.